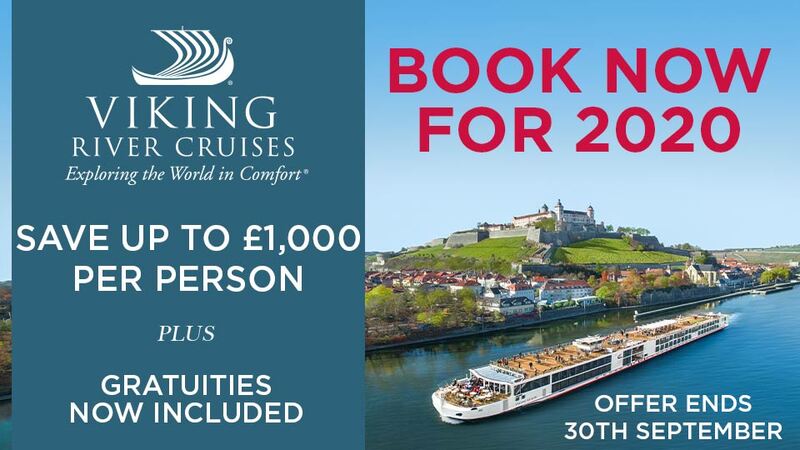 Tauck's Christmas market tour and river cruise along the Rhine, from Köln to Basel aboard ms Grace or ms Inspire, is the perfect way to capture all the magic of Christmas Markets in Germany and France. Along with all the inclusions that are part of every Tauck river cruise, Tauck's Christmas market tours wow you with special holiday touches like an onboard tree-trimming party... glühwein and other seasonal treats aboard the riverboat... a traditional European Christmas dinner with all the fixings... special evenings of onboard holiday-themed entertainment... visits to markets in cities like Aachen and Colmar that other holiday cruises don't visit... walking in the footsteps of celebrities at the Kurhaus casino in Baden-Baden... a lecture on Alsatian storytelling traditions in Strasbourg... a cookie-making demonstration and a visit to the fanciful Siegfrieds Mechanisches Musikkabinett in Rüdesheim... a traditional German lunch in Heidelberg and much more! If you arrive earlier than 4:00 PM, you might want to go into the city to see the Christkindlmarkt – said to be the largest and most traditional in Switzerland – and perhaps have your first taste of the traditional glühwein that is so much a part of the Christmas market scene. Back on board the riverboat, meet your Tauck Directors at a discovery/welcome briefing, and enjoy a casual captain's welcome reception followed by dinner – and one of the best Christmas market tours begins! Tauck's Christmas Market tours northbound along the Rhine begin with an excursion to the romantic village of Riquewihr, France, set between the Vosges Mountains and the vineyards in the Alsace near the German border, where not much has changed since its early days as a winzerdorf (wine village). This little medieval town still looks much as it did in the 16th century and it's easy to feel like you're in the middle of a fairy tale; while you're here, you might want to buy a special Christmas ornament to add to the riverboat's on-board Christmas tree. Have lunch in Riquewihr, known for its fine, locally produced Riesling and other Alsatian wines. With its ancient buildings, half-timbered houses, Renaissance structures and crooked houses on crooked lanes, being in the city center of Colmar is almost like walking through a wonderful living museum; seeing Christmas traditions unfold in such a setting as you browse Colmar's Christmas market is unforgettable. Back aboard the riverboat, join us for dinner, then celebrate with your fellow travellers at our tree-trimming party as you help decorate the riverboat's Christmas tree, a highlight of all Tauck Christmas Market tours! 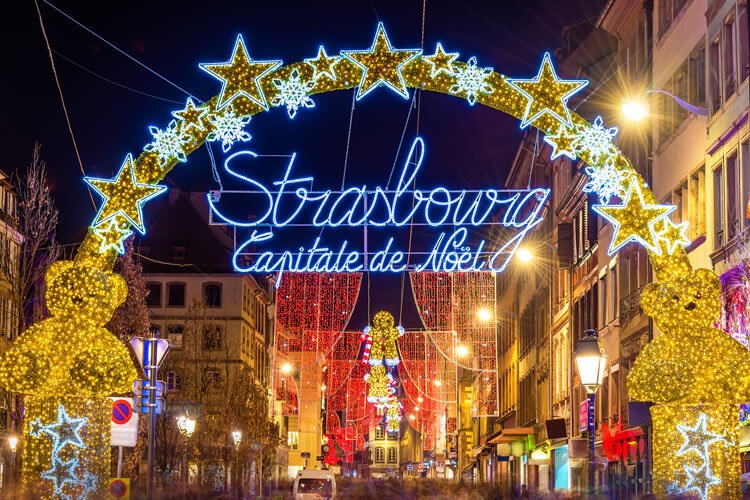 Strasbourg would like you to think of it as the "Capital of Christmas" and it is, after all, the "Capital of Europe" in a sense – being the home of the European Union. Before a walking tour through this ancient French Alsatian city, whose entire center is a UNESCO World Heritage Site, gain some insights about storytelling traditions with an expert local guide during a lecture aboard the riverboat. The setting of Tauck's Christmas market tours – around Strasbourg's Gothic Cathedral de Notre-Dame – is breathtaking. After a walking tour of the Christkindlmarkt, you'll have leisure time to explore on your own – and have lunch in town or return to the riverboat on one of the shuttles that will run between the city and the dock for most of the afternoon. Back aboard the riverboat, join your Tauck directors for a discovery briefing before dinner, and enjoy a live musical performance aboard ship tonight. The riverboat docks for an excursion to Baden-Baden; this famous Black Forest spa town is the ideal setting for a winter fairy tale at Christmastime. The tempting aromas of glühwein and gingerbread linger among the labyrinth of stalls in the Weihnachtsmarkt. With its natural springs reputed to have healing powers, Baden-Baden has long attracted the wealthy elite, who come to take the waters and play in the magnificent Belle Epoque casino, the Kurhaus, adjacent to the Christmas Market; get a taste of what being one of “the in-crowd” feels like as you visit the complex. Discover more of Baden-Baden on your own, perhaps indulging in more gingerbread and glühwein. This evening, your riverboat sets off for Speyer, from which you'll travel to Heidelberg tomorrow. A day in Heidelberg promises both holiday cheer at its Weihnachtsmarkt and insights about life here past and present. A tour of Heidelberger Schloss high above the city reveals the ruins of this mighty medieval castle and a sense of what it might have been like to live there so long ago. A funicular ride leads to a walking tour of the city’s Old Town and Heidelberg’s Christmas Markets, winding up with a traditional German lunch – featuring award-winning local beer – in the heart of the city. Spend some free time in the hometown of Germany’s oldest university before catching up with the riverboat for tonight’s cruise. After a leisurely morning spent cruising along the Rhine and enjoying your riverboat's amenities as you please, there's more Weihnachtsmarkt fun waiting for you in the romantic town of Rüdesheim in the Rhine Valley. After a stroll through the Christmas market near the pier, walk or ride a mini-train (weather permitting) to Siegfried's Mechanisches Musikkabinett, a museum featuring an impressive collection of mechanical musical instruments, some dating back centuries, housed in the Bromserhof, a 16th-century castle. A cookie-baking demonstration shares secrets of traditional treats like lebkuchen and stollen, which are very tasty when accompanied by special Rüdesheim coffee laced with local brandy. After some free time, return to the riverboat for dinner; maybe you'll want to take a stroll ashore later. Spend the morning cruising, arriving in Köln (Cologne) in the early afternoon. You can choose to stay in Köln for a guided tour of this historic cultural center of the Rhineland – with its Christmas Market adjacent to the Gothic, twin-spired Kölner Dom – or head out on an excursion to Aachen. As you explore Aachen’s Weihnachtsmarkt, follow the seductive smells of cinnamon, coriander and ginger to the town’s unique holiday pastry, Aachener Printen; it tastes as good as it looks! Join us for the captain’s farewell reception followed by dinner tonight... and you may want to raise one last cup of glühwein and toast the wonderful time you've had discovering Christmastime along the Rhine. Fly home anytime. 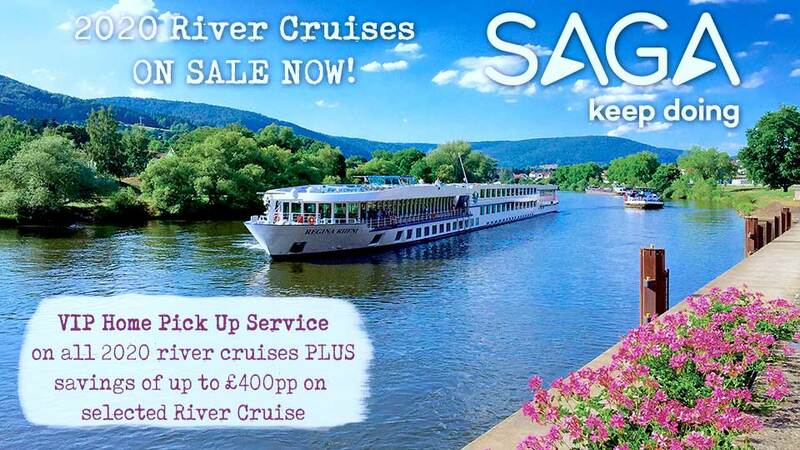 Transfers are included from the riverboat to Cologne / Bonn Airport. Guests enjoying a post-stay in Köln will receive a transfer from the hotel to the airport. Please allow three hours for airport check-in. We wish you a safe and pleasant journey home. 7 nights on board ms Grace or ms Inspire.